We are now over a month into 2017 and it’s finally time for Life of Burgers to get back into the swing of things by chowing down on some delicious burgers! I decided for the first Halifax burger of the year, that I would visit a place that has been recommended to me a few different times, but I had yet to give it a try (except for Burger Week 2015). Cheachie’s is known for their menu of Mexican food and burgers, some of which are actually comprised of a combination of two of their regular burgers! Wanting a burger that was a bit more modest, I went with the Big Earl. Accompanied by a neat pile of fries, this large burger was carefully constructed so that each ingredient could be seen. 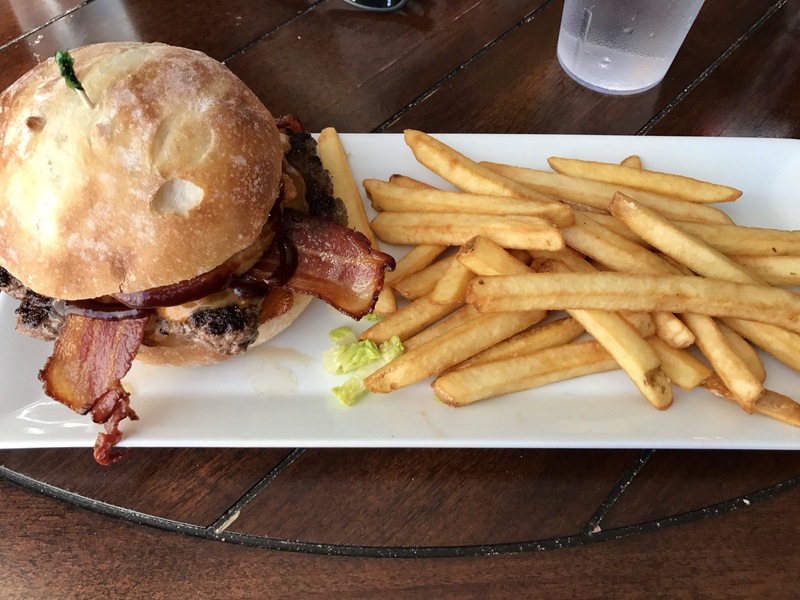 The misshapen patty was nice and thick, and both the beef and the bacon looked very juicy. There was a big onion ring sitting on top of the meat, and everything was smothered in a thick BBQ sauce. Just by looking at it, it gave the impression that it would be a solid burger. The first thing you taste when you bite into the Big Earl is that bold BBQ sauce flavour. They put just the right amount on so that it isn’t too overpowering, but you still get that kick. The onion ring gave the burger a bit of a crunch, and the two strips of bacon were cooked nicely (crispy bacon has no place on a burger). The beef patty was pretty juicy, but I did feel that the meat was a bit overworked and it wasn’t as tender as I would have liked. It also would have been nice to have a bit more cheese, as a burger the size just begs for ample amounts of the melted stuff! Also worth mentioning was the bun. It had a tougher exterior, but the inside was soft and fresh, and it had no problems holding everything together for the whole burger. The Big Earl costs $14.95, which includes either fries or a salad for a side. Given the amount of meat in this one, the price isn’t horrible. This isn’t the cheapest burger out there, and with the lack of any ‘premium’ toppings I would like to see the tiny issues I mentioned earlier be fixed, but this still is not a bad price for a very filling burger. I’m fairly pleased with my choice for the first official burger of 2017. This burger was definitely filling, and there were some really nice flavours going on between the buns. I did have a couple of issues, but they are very small (I can get nit picky sometimes) so they really are not a deal breaker, and I can for sure see myself coming back in the future to try a different creation (maybe I’ll even work up the courage to try one of those ‘Super Burgers’ that are proudly displayed on their menu!). 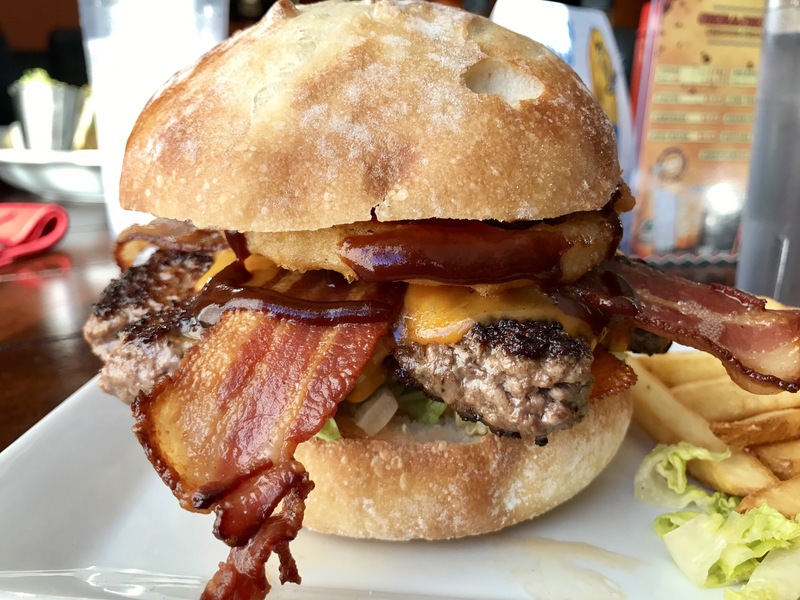 Be sure to follow Life of Burgers on Twitter, Instagram, and Facebook for all the burger awesomeness that the city has to offer! Lovely review and great tips!